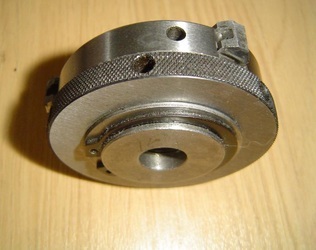 Though my Perris lathe came with a 4-jaw, I had always hankered after a 3-jaw scroll chuck for speedy setting up. But the only ones available to suit ½” x 20 UNF spindles seem to be $120 versions from Sherline to fit their obsolete models. With shipping, import tax etc that could have ended up at £120, which was a bit too much. 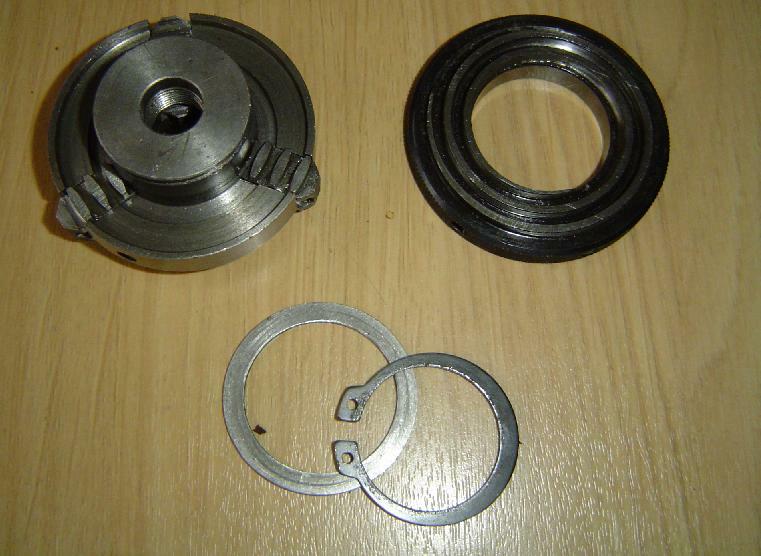 However, lever operated 63mm chucks with M14 x 1 threads can be had, and I found one going cheap. Looking at it, there seemed enough metal in its body to bore it out for a bush with an internal ½” thread. Here it is, both assembled and dismantled. It’s only held together with a circlip at the back, with a washer beneath. Not exactly quality engineering. The minor diameter of M14x1 is 13mm, and the major diameter of ½” UNF is 12.7mm. A bush to those dimensions would have impractically thin walls, so the chuck body needed to be bored out and rethreaded. I went for M17x1 (minor diameter 16mm); not exactly a standard thread, but it didn't need to be provided the bush was made to match. To get started, I held the body of the little chuck in the 3-jaw on my larger lathe, bored it out to 16mm, and cut a 60° thread in it to a depth of 0.5mm. With a 3-jaw, the threaded hole and the bush were probably a tad off-centre, but that didn’t matter. What did matter was getting the ½” UNF hole through the bush in the right place. Next job was to make the bush from mild steel, threaded externally to suit the M17 x 1 thread in the chuck body and threaded ½” UNF within, and with a thin flange on the end. The bush was formed on the end of a 2” length of 1” round MS bar. First, two flats were milled where the flange would be formed, so a 20mm spanner could eventually be used to tighten the bush into place, and equally importantly to unscrew it if I made a mess of the internal thread and had to start again. The red tape was merely to help get the flats opposite one another. Then, the bush-to-be plus an extra inch for chucking purposes was sawn off the parent bar, and turned down and threaded on the outside until the chuck body would screw on. I made the threaded section a bit long, and took facing cuts to get it just the right size. While it was in the chuck, I drilled it 10.5mm, to be bored out later to 11.5mm ready for internal threading. Finally, I parted/sawed off the bit I needed. Here’s the bush, in and out of the chuck. You can see how far my parting tool reaches from where the sawcuts start. The bush needed to be bored out to 11.5mm, the minor diameter of the UNF thread, and then threaded. Hoping to achieve some concentricity, I assembled the little chuck with the bush Loctited in place, and gripped it on to a 12mm diameter silver steel bar which had been persuaded to run true. There it would remain until the boring and threading was done. The parted/sawn end was reduced with facing cuts to about 3mm thickness. With no boring tool small enough, I used one of the remaining good tips on a chipped 3/8” end mill, held at a slight angle to the lathe axis for clearance, and completed the boring job. I used a home ground threading tool, which had to be pretty slender and thus lacked rigidity. The thread was only about 0.6mm deep, so multiple light cuts didn’t take too long, and when almost there finished off with a ½” x 20 UNF tap, supported by a tailstock centre to keep it in line. The final job was boring out the outside end of the thread to fit the 0.500” register on a Perris spindle (I fitted a better one, so the old spindle could be used to check the register diameter). Here's the chuck in place on the lathe. A quick trial holding a 12mm silver steel bar showed 0.004” TIR next to the chuck and the same at 2” out, which is reasonable for what it will be required to do. Other diameters may exhibit different TIRs, of course; I don’t expect wonders from what is basically a cheap little Asian item.